Annabel de Vetten of Conjurer's Kitchen really puts the death in "Til death do us part" with this morbid wedding confection. 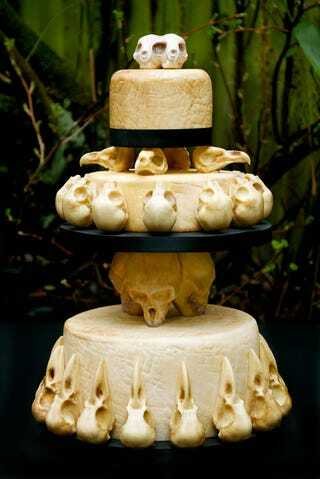 Instead of flowers and flourishes, her latest wedding cakes are decorated with chocolate animal skulls. It features solid chocolate skulls of 16 carrion crows, 12 domestic kittens, 3 Vervet monkeys, and 4 barn owls, all of which the artist sculpted by hand. Made from White Chocolate Mudcake, the cake took her over 100 hours to complete in total. There are two options of toppers: a chocolate conjoined kitten skull, or dried flowers from an actual wedding bouquet. It also helps that the icing on the cake appears aged for that extra dose of death. The cake's probably delicious, but I'd give those skulls a good sniff before I tried to bite into one.